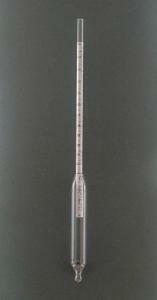 Use these hydrometers with all processes where specific gravity or density of liquids is an important control. The design of this hydrometer ensures easy cleaning and a low likelihood of breakage. The clear markings allow accurate readings. Accuracy: ±0.001. Size: 12"L.